Apple's newest iPhone XS/XR was unveiled on September 12, 2018. If you are just looking for watching DVD movies with a giant OLED display with 22688x1242 resolution on the go, stand a good chance with the new smartphone. But you have to face the hurdle. Until now, no phablet has and will have a DVD drive, neither does iPhone XS/XR. 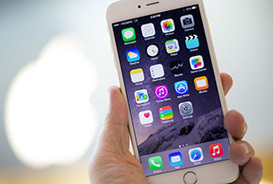 To rip and play DVD movies on iPhone (iPhone XS/XR/XS Max), one has no choice but to rip and convert DVD to iPhone accepted video formats like MPEG4 (MP4) or H.264 first. So a trustworthy Mac DVD ripper is dispensable. How to Rip DVD to iPhone without Any Quality Loss? Here I strongly recommends you the unmatchable DVD ripper - MacX DVD Ripper Pro, which can rip copy protected DVD to iPhone friendly format like MP4, H.264 without any third party help. Better still, this edge-cutting DVD ripper is armed with advanced High Quality Engine to ensure you to rip any DVD (homemade or commercial) to iPhone XS/XS Max/XR/X/8/8 Plus/7s/7/6s/6s plus,, iPad Pro/Air 2/mini 4, Android etc with pristine high quality. Step 1: Load DVD Movies or DVD Folder. After free download this DVD ripper on Mac or Windows version on Windows (10) PCs, launch it and click "DVD Disc" button to import the DVD movie. Alternatively, you can also load DVD folder by clicking "Path" button. Step 2: Choose the Output Video Format. Here you can choose to iPhone MP4 as output format from the "to iPhone Video" profile in the drop-down box. Tip: There is a slider on the right, "LQ" means "Low Quality", and "HQ" stands for "High Quality". So you can adjust the slider to improve your output DVD video quality. Of course, when you choose "HQ", the converting procedure will cost a little bit more time than ordinary case. Step 4: Start Conversion. After finishing the above steps, click the "RUN" button to begin to convert DVD to iPhone X/8 on Mac OS, you could view the conversion progress and are able to cancel the converting process at anytime. Notes: MacX DVD Ripper Pro also empowers you to rip DVD The BFG, Captain America: Civil War to MOV, FLV, AVI, DVD to Samsung Galaxy S5, HTC, etc on Mac irrespective of copy protection insert in DVD. And it's worth extra trying by embracing unique DVD backup feature as well as wizard-style interface, all having no problem to copy protected DVD Mac. Finally, to watch DVD movies on iPhone 8/Plus, you can fall back on MacX MediaTrans to transfer videos from Mac computer to iPhone without any hassle, no matter in iPhone recognized video formats or not. This guidance offers you the easiest solution to rip and convert DVD to iCloud for storing. Then you can easily stream DVD movies on Mac iPhone iPad Apple TV. 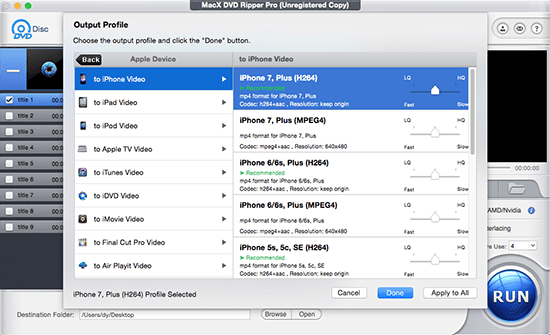 MacX DVD Ripper Pro is the best DVD to iPhone ripper for Mac which can freely rip DVD to MP4, MOV, M4V iPad supported formats or iPad Pro/Air 2/mini 4 and backup any DVD disc, ISO image, DVD folder on Mac (MacBook Air/Pro, iMac etc) in 1:1 quality with original quality.